California law allows a person who filed a divorce petition, called a “petitioner,” to amend that petition to accommodate a change in circumstances or to correct information that was originally included or omitted by mistake. You need to prepare and submit another FL 100 form, the same form you initially used to file for dissolution of your marriage. Because the amended petition contains new information, your spouse must receive a copy of your amended paperwork. Acquire Form 100, the divorce petition, from the clerk’s office where you filed your original form. There is no charge for the paperwork. Alternatively, you can also download form FL 100 from the California Courts website or fill it out online and then print it out. Check the “AMENDED” box that appears within the heading at the top of the first page of the petition form. Fill out the amended petition paperwork as you did when you initially filed for divorce, ensuring you include the new information. 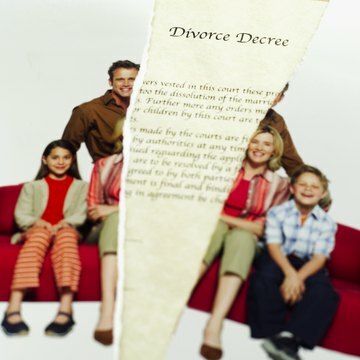 For example, if you claimed in your initial divorce petition that only the household furniture is community property and now want to amend your petition to include a television as community property, list both the household furniture and television in your amended petition. Make two photocopies of your completed amended petition. File the original amended petition with the clerk, as you did when you filed your original petition. Unlike with the original filing, there is no fee for filing the amended paperwork. Ask the clerk to file-stamp your two photocopies. One copy is for your spouse, and the other is for your records. Direct a process server to deliver one stamped photocopy of your amended petition on your spouse. The process server will complete and return to you a document called a “Proof of Service.” File that document with the court clerk. Some process servers will file the Proof of Service for you for an additional fee. Locate a process server in your local telephone book or online.